I wanted to use a embedded linux system to the drive to clock, so that I can easily control everything over WiFi. I went for an Raspberry Pi 2 as they're quite popular and easy to handle. Instead of multiplexing all the LEDs I went for an LED driver per segment. This makes everything a little more costly as you need a few more of those chips, but the driving is much less time critical which is an advantage if using a non realtime operating system such as Linux. Also we don't have to care about any multiplexing issue while filming or photographing the clock. The original clock uses fourteen-segment displays for the month display and seven-segment displays for the rest of the digits. I opted for sixteen-segment displays for all digits as this makes it easier to display alternative text on the display and also it was very difficult to find fourteen/sixteen/seven-digment display which match in their look. As the PCBs need to be much bigger (32cm × 5cm) than my hobby version of EAGLE allows for I took this as a chance to have a look at KiCad. 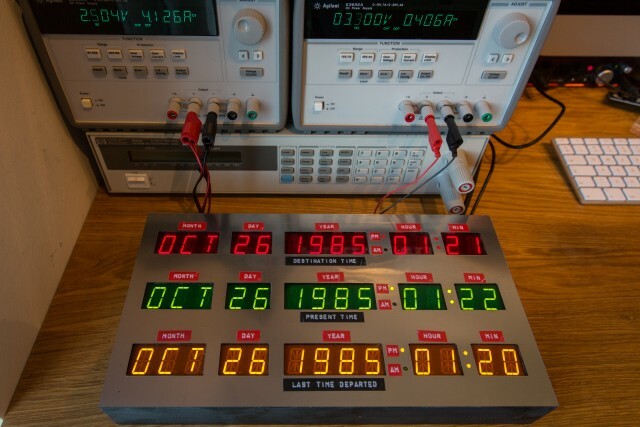 The clock itself will be made out of 5 PCBs: The Raspberry Pi, a hat module which plugs on-top of the Raspberry Pi and generates the voltages needed by the display and three rows of digits, which are daisy-chained on the Raspberry Pi's SPI interface. You'll find the schematics and PCBs at the GitHub repository. As the three rows of digits consists of different color the resistors which set the LED's current have to be different. 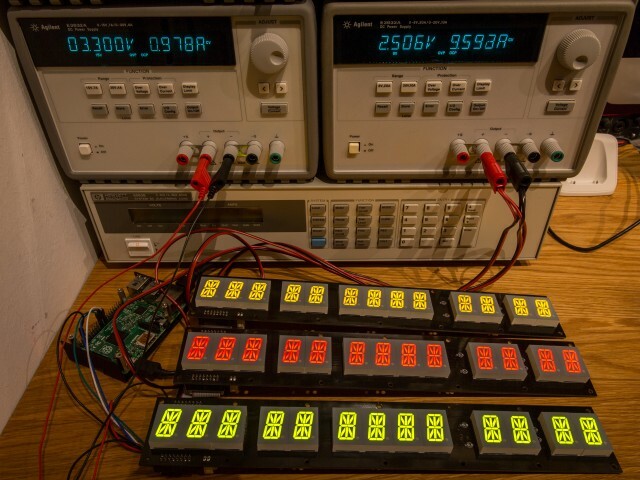 To the LEDs in intensity I assembled the first board with three different colored digits. In the next step I could assemble three complete boards. As I soldered them all by hand I was expecting some issues with the boards and therefor I hooked them all up and tested them with different patterns I implemented in the software. The all-LEDs-on test was also a good way to get first measurements for the design of the power supply board. I figured out that a voltage of 2.5V is enough for all the LEDs to light up perfectly and do not waste to much energy on the LEDs drivers as they have to burn all energy which is not used by LEDs. The last thing was the design of the case for the clock. I decided to go with a custom build case with parts out of the laser-cutter at the local fab-lab Die Werke. My first approach was to test build something out of MDF to see how everything works. The MDF case consists of several layers out of 3mm MDF which are glued together. 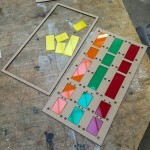 The first layer provides the visible front, the second holds the colored windows out of acrylic glas and nuts to screw the PCBs to. The rest of the layers provide an outer ring as side walls. The labels on the front were engraved with the laser-cutter. Originally the MDF case was designed as a prototype but I liked to look, so I decided to keep it and build a second clock out of acrylic. As the laser-cutter cannot cut through metal and I wanted to have the metal look as in the movie I bought some black acrylic which has a very thing layer of aluminium on-top of at Innograv. The rest of the design was very similar to the MDF prototype except that the walls are not layered but solid pieces and the labels are printed with an old-school DYMO M-10 Label Embosser. So the clocks are now almost finished, except for the power board which is still missing, but the PCBs are already on the way to me. This entry was posted in Electronics and tagged Raspberry Pi by twam. Bookmark the permalink. 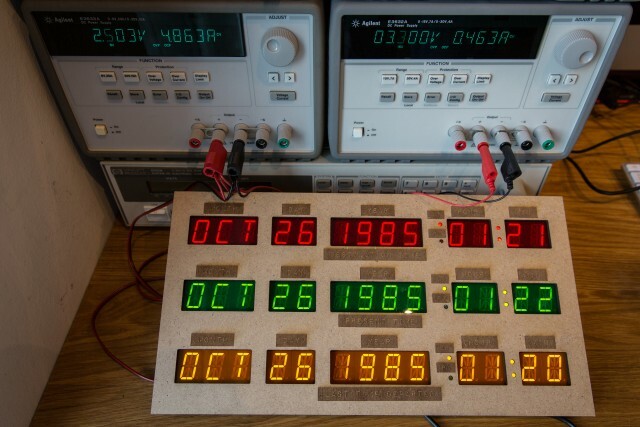 Just popping in to say that this has been an absolute blast to read through, it brings me right back to some of my early college projects, making time circuits, though not quite as fancy as the one you have here! It would be a blast to see the 100% finished product even though this one is already at a really fancy stage. I think the use of the Dymo tape was a great touch on the overall design. I wish you a great continued day and all the best with your future projects. Hey, das ist ja mal Klasse, sieht ja spitze aus. Könntest du jetzt zum Beispiel die Zeile "Present Time" als normale Uhr laufen lassen? Du kannst anzeigen lassen, was auch immer dir beliebt, da du die Software anpassen kannst. In der aktuellen Version ist das aber schon eingebaut. Auf dem Bild im Maker Faire Artikel zeigt die Uhr in der mittleren Zeile z.B. die aktuelle Zeit an. habe deine tolle Arbeit auf der MF2015 in Hannover bewundert und mir selbst dazu ein paar Gedanken gemacht. Der Aufwand mit den Texas-Chips war mir etwas zu hoch, deswegen hab ich es mit dem Holtek HT16K33 probiert. Das Teil ist genial und spottbillig (80cent bei RS). Habe jetzt 2 Chips pro Platine + ein wenig Hühnerfutter. Aufteilung der Controller ist bei mir 7 zu 6 für die Anzeigen. Das ganze wird per I²C Bus angesteuert. So braucht man nur 4 Leitungen für den "Antrieb" der ganzen Anzeige-Einheit. Vielen Dank für dein Feedback. Ich bin mal gespannt, wie eure Uhr dann ausschaut! Gibt's auch irgendwo eine Online-Doku oder reicht's @Arduino_H zu folgen? Wenn die Hardware fertig ist, werd ich mal bei Arduino-Hannover einen Artikel darüber reinsetzen. Du kommst doch auch aus H, oder? Alles klar, dann behalte ich das im Blick! Ich habe zur MakerFaire noch in Hannover gewohnt, aber inzwischen bin ich nach Tübingen umgezogen.